The importance of understanding complex toxicological and chemical properties of hexavalent and trivalent chromium has increased rapidly over the last few years as state and federal regulators reevaluate environmental standards. The risk management of chromium-contaminated soils continues to be a very dynamic process that presents interesting challenges. 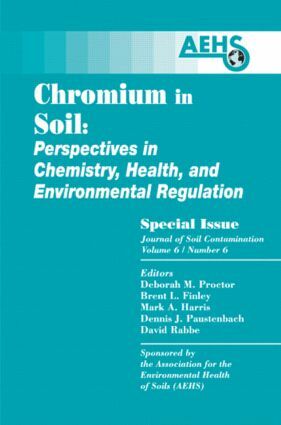 Chromium in Soil discusses the challenges faced by those investigating and remediating chromium-impacted soils and groundwater. The chapters address numerous ground-breaking developments in various fields of environmental chromium research, including toxicity, chemistry, environmental fate and transport, remediation technology, and health-based cleanup standards.